The DB6 sports car, produced between 1965 and 1971, was a successful model, with a total of 1967 cars being built, covering the Coupe, Volante convertible, Vantage, Shooting Brake estate, and Mark 2 variants. In September 1967, the successor to the DB6, designated the Aston Martin DBS sports car, was introduced within the prestigious grounds of Blenheim Palace. This two door, four seater coupe was a grand tourer that, for the next three years, was produced alongside its predecessor, although it was originally intended that production of this model was to be limited prior to it being succeeded by the Aston Martin V8 saloon. In order to cater for the increased seating capacity, the DBS was a larger coupe than was the DB6, and had a curb weight of 1588 kg. In terms of body styling, in order to be in step with the prevailing market of the mid to late 60's, the rear section was in the style of a fastback, whilst the frontal area received a squared off grille containing four headlights. However, certain distinctive external characteristics of the Aston Martin were retained, such as air vents positioned along the sides, an elongated air scoop on the bonnet, and knock-off wire wheels. This was a landmark model insomuch as it was the last to be built under the influences of the company's founder, David Brown. A great deal of kudos was gained when this sports car was featured in the 1969 James Bond film "On Her Majesty's Secret Service". A total of 787 DBS's were built. Notwithstanding the fact that the DBS had marginally grown in size, it was still powered by a 4 litre, straight six, DOHC engine, that generated 282 bhp at 5500 rpm, and 288 ft/lbs of torque at 3850 rpm. Fitted with either a ZF five speed manual gearbox or optional Borg-Warner automatic transmission, an 8.9:1 compression, and three SU carburettors, it produced a top speed of 140 mph, with 0-60 mph in 8.5 secs. However, as with the DB6, there was the option to add the higher performance Vantage engine which produced 325 bhp at 5750 rpm and 290 ft/lbs of torque at 4500 rpm. When fitted with three twin choke Weber carburettors, and a 9.41 compression, this version produced a top speed of 143 mph, with 0-60 mph in 6.5 secs. Following calls for a still more powerful DBS, in September 1967, Aston Martin launched the DBS V8 sports car, which was to be built alongside the original DBS. The curb weight of this model increased from 1588 to 1820 kg owing to the addition of air conditioning, heavier vented disc brakes, and additions to the front section bodywork. Features that distinguished it from the DBS included a larger air scoop on the bonnet, rear lights from the Hillman Hunter saloon, and specially designed lightweight alloy 15 inch wheels. A total of 4,021 DBS V8's were built, which included Vantage and Volante convertible variants. 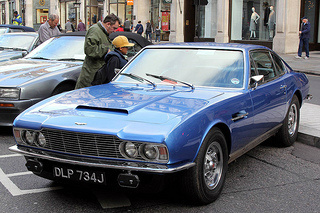 Good publicity was gained when Roger Moore used a DBS V8 sports car in the television thriller "The Persuaders". The highlight of this 2+2 fixed head coupe was that it was powered by an alloy, 5.3 litre, DOHC, V8 engine that developed 315 bhp, and 400 ft/lbs of torque at 4500 rpm. Fitted with a stronger ZF manual five speed all synchromesh gearbox or optional three speed automatic transmission, a 9:1 compression, and Bosch fuel injection, it produced a top speed of 160 mph, with 0-60 mph in 5.9 secs.